"The Assassination of Jesse James"
Timeless is an odd series. Tonally, it’s a bit all over the place, sometimes a rambunctious time-travel heist, sometimes a moody sci-fi drama, and sometimes an Alias-style, twist-driven story of nefarious secret organizations and double agents and so on. In all of these shows, characters and history sit at the center, and while the whiplash between styles ensures that the show isn’t often predictabe, it also rarely feels settled, complete, or fully-formed. With “The Assassination of Jesse James,” Timeless bucks that trend. As with “The Alamo” and “Party at Castle Varlar,” the latter of which was also written by Jim Barnes, who pens this week’s installment, the episode manages to balance the silliness, trip-to-Wikipedia historical nuggets, and overall mythology with a story that roots the characters in struggles that matter. It’s pretty simple, really. They just raise the stakes, in big ways and small, and tie the struggles of the characters to a theme that resonates historically. It’s not sensational, but it’s impeccably made, without a scene or moment wasted. Add in a few solid quips and one unexpectedly funny shot of Abigail Spencer falling over a horse, and you’ve got Timeless as, perhaps, it will be: a history-loving time travel story that takes its characters seriously and itself, not at all. It’s not without flaw, of course. The episode opens with a trio of scenes that set up exactly what will be burdening the minds of the three leads, and while each is effective in its way—Rufus’s especially so, given how unexpected it is—they don’t exactly run together smoothly. Still, it gets the job done, and in no time we see Wyatt meet the man who (probably?) killed his wife (“Not unless I had a time machine”), drop into Lucy’s nightmare about her sister, whose birthday she forgot, and watch Jiya excitedly tell Rufus she’s the next Lifeboat pilot. That one’s particularly engaging, given that it’s the direct result of Rufus’s line drawn in the sand in the preceding episode. Each neatly ups the stakes for each of our leads, particularly in Rufus’s case. His scene with Conor Mason (Paterson Joseph) adds a deadline into the mix: It’ll take six months to train Jiya, at which point Rufus becomes expendable. That’s a lot to pack in before the credits, and that’s not even the end of it. Next up: Jesse James (Daniel Lissing), not getting killed while dusting a painting thanks to the timely arrival of Garcia Flynn. 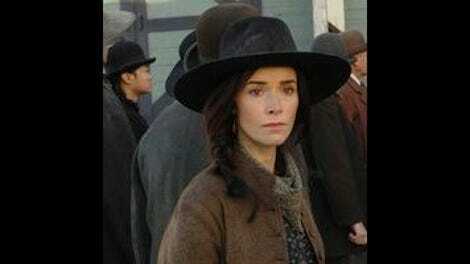 It’s all remarkably efficient for Timeless, which has often spent a lot of time on exposition and vague worldbuilding. Instead, we’ve got three character focal points and a pairing that will last for most of the episode (and give Goran Visnjic more of substance to do than he’s had in the series thus far). While Lucy, Rufus, and Wyatt have to confront some hard truths about themselves, Flynn is gaining some murderous insight from Jesse James as well. It’s a delightful surprise to see Timeless address the fact that Flynn’s plan is needlessly violent, given his aims; it turns what seemed like a massive plot hole into a clever piece of character development. It also fills the time as James and Flynn make their way to the “treasure” on Flynn’s map, and lo and behold, it’s a person. It’s not even a member of Rittenhouse. It’s another pilot, and of all the clever parallels ”The Assassination of Jesse James” pulls off, this one is perhaps the most satisfying. Emma (24’s Annie Wersching) makes twin appearances here, first in her brief scenes with Flynn as he recruits her to Team Evil Time Travelers, and second in footage Jiya yanks from the Mason Industries servers. We learn that Emma faked her own death to escape Rittenhouse and Mason Industries, and she’s been hiding in the Old West ever since. The trick of introducing a second pilot as a threat, in more ways than one, to Rufus while also planting a second pilot for Flynn’s team is a neat one, allowing for an incredibly efficient and effective exposition drop that allows us to see Flynn’s recruitment of Emma while we watch Jiya discover that a woman’s death was hidden from her. It’s a terrific and slightly frightening sequence, masterfully constructed. Cheers to Barnes and director John F. Showalter, because this worked like gangbusters. It all leads up to the final showdown, of course. 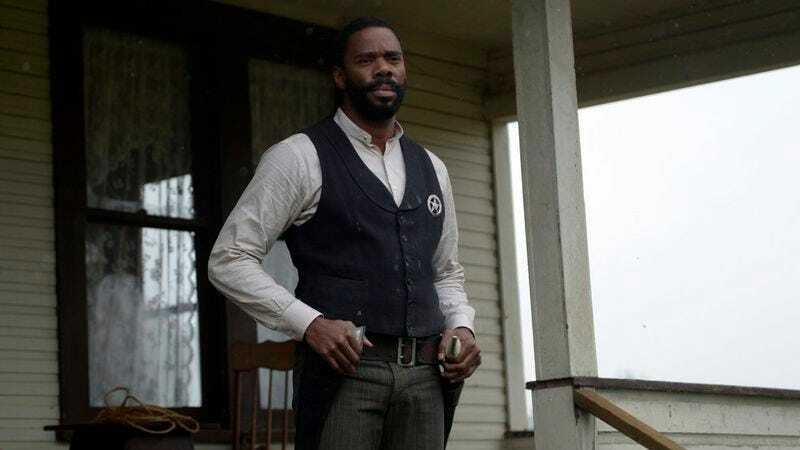 After Grant dies, Wyatt and Bass Reeves face off about whether or not it’s best to kill Jesse James, who makes a point of disarming himself and surrendering (after blowing the cabin to pieces with a piece of high tech weaponry, no less). Of all the surprises in this episode, the revelation that it’s ultimately Lucy who kills Jesse James is the greatest. Abigail Spencer’s terrific in this show, week in and week out, but this is easily her best moment. Knowing what happened to her sister, and what could happen to others, she safeguards history and takes a life. It’s stirring stuff. There’s a coda, of course, with Jiya finding herself threatened by Mason, Wyatt appealing to Rufus to help him steal the Lifeboat and jump back to stop his wife’s killer (without killing him), and Lucy finding herself in the pages of history as Jesse James’s killer, and it’s all great, but the heart of the episode stops when Lucy pulls that trigger. Timeless isn’t like this every week, but if this is an indicator of where the show could go, then the world had better start calling out for its renewal. So if Lucy remembered Amy’s birthday in her dream, doesn’t that mean she remembered? Timeless continues to be progressively more thoughtful in the ways it addresses race. I particularly liked Rufus’s tone-deaf questioning of Grant. Even the most thoughtful of us can be idiots sometimes. The look on Rufus’s face when he realizes the Lone Ranger was black is incredible. The fact that I, and I’m guessing lots of other people watching, didn’t know that is horrible. And “Tonto”? Good lord. Why didn’t anyone else tell Jiya about Emma? You think there’d be some sort of memorial.